WWII Vet, AWOL From Nursing Home, Found At Normandy Ceremonies : The Two-Way After Bernard Jordan's nursing home in Sussex couldn't sign him up for an organized trip, the 89-year-old put on his medals and headed out on his own. The nursing home reported him missing. Normandy veterans parade in Arromanches, France, during events to mark the 70th anniversary of the D-Day landings. Love this:89yr old veteran reported missing by care home who said he can't go to Normandy for #DDay70 remembrance. We've found him there! 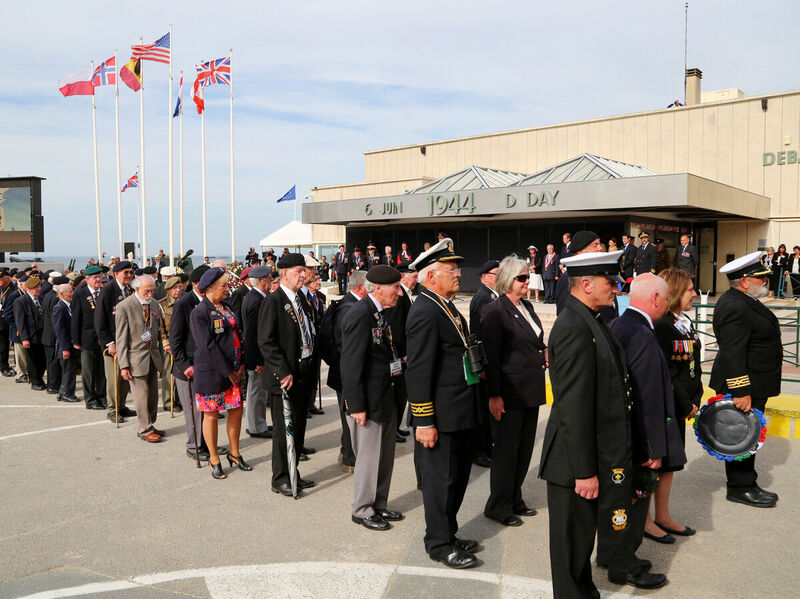 An 89-year-old World War II veteran, reported missing by his U.K. nursing home, has been found at the D-Day commemorations in France. Bernard Jordan, who served in the Royal Navy during WWII, is a resident at The Pines nursing home in Hove, Sussex, reports the BBC. He had previously attended the 50th and 60th memorial services in Normandy. Nursing home staff attempted to sign Jordan up for a formal trip to the 70th anniversary, but they say the request was too last-minute and it wasn't possible. It appears that Jordan decided to travel on his own. He was last seen at The Pines on Thursday morning, and was reported missing to police when he didn't reappear that evening. According to Sussex police, he had worn his war medals and a raincoat when he went out from the home. He joined a group of vets who were traveling to France by bus, reports The Associated Press. One of his fellow veterans called to say that Jordan was at a hotel in France. Police officers spoke to Jordan and confirmed he was fine. The chief executive of the company that runs the home says that Jordan was not banned from attending the commemorations. "He can come and go from the home as he pleases, which he does on most days," the executive told the BBC. "At no stage was he banned from going to the commemorations." Jordan, the former mayor of Hove, lives with his wife at The Pines. Police told the BBC that Jordan's friends will make sure he returns safely to Hove after the celebrations in Normandy are over.